“We need a new idea of how to govern. The current system is broken. 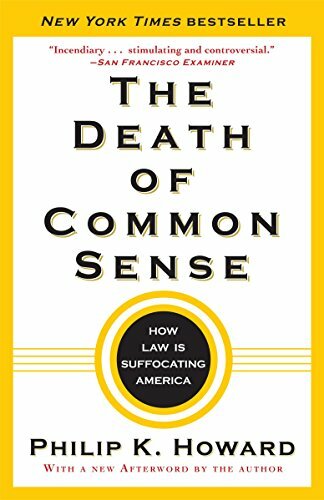 Law is supposed to be a framework for humans to make choices, not the replacement for free choice.” So notes Philip K. Howard in the new Afterword to his explosive manifesto The Death of Common Sense. Here Howard offers nothing less than a fresh, lucid, practical operating system for modern democracy. America is drowning—in law, lawsuits, and nearly endless red tape. Before acting or making a decision, we often abandon our best instincts. We pause, we worry, we equivocate, and then we divert our energy into trying to protect ourselves. Filled with one too many examples of bureaucratic overreach, The Death of Common Sense demonstrates how we—and our country—can at last get back on track. “A brilliant diagnosis . . . forceful, trenchant, and eloquent.”—Arthur M. Schlesinger, Jr.
Philip K. Howard is a lawyer and the author of The Death of Common Sense. He has advised leaders of both parties on legal and regulatory reform. Howard grew up in small towns in the South and is the son of a Presbyterian minister. He is a managing partner of an international law firm and lives in Manhattan with his wife. They have four children.